Hey! That's me in a real studio for once! Order the physical CD - I sign them if you buy 2 or more of any CD, or 1CD + a shirt. 4th album is done! I will say they don't get any easier, especially on that last stretch, but I'm very happy with how it turned out and hope you are, too. The first 6 tracks were composed for Iridium Studios' "There Came An Echo". Be sure to check out the complete soundtrack w/ other original tunes from Big Giant Circles and a collab between the two of us (Throwing Circles). Super cool of Jason Wishnov of Iridium to to allow me to release tracks 1-6 before the game release. Also huge thanks to him for 2 years of technical and creative input from him on those tracks while still allowing me to make them my own. Such a fun process. The physical CD is packaged in a high-quality digipack like my other CDs (digipacks are a step up from a normal jewel case). I designed the cover art this time and had awesome help with the inside and technical details from an artist named Mary Betowt. She's the artist who designed my portrait shirt. - Stores list: My MP3 Store (directly from me), Bandcamp, iTunes, Google Play... I think it's out just about everywhere now. Thanks a million for continuing to listen to and purchase my tunes. I'm super thankful for it, and I'm pumped about this release! I've listened to this album four times tonight. I love it! I'm floored. This album is insane!! Are you going to announce it on YouTube with a jam-along like you did for Days Away? Will you be uploading any new videos at all!? This album is incredible. Buy it now unless you already have, then tell someone else to buy it. The piano work on Fall Drift and All The Circles is worth the price of the album, even if the other stuff weren't so good, but it is. This album is straight up incredible. I already said that. Just made it to 'In Blue' and tears of joy are streaming down my face. Keep on rocking the killer jams Ronald, time to go order some physical cd's! You just made my year! Thanks, Ronald! From a former member of the Ohio State Marching Band, former Las Vegas musician, and someone who has been following you since before the release of your first album, your music continues to humble me and remind me why we live in this world. This album, especially the back half.....speechless....you can feel every emotion. I'm just at a loss for what a wonderful gift you have. I only hope one day I might convince you to let me commission a song for my ten year wedding anniversary (next year), or that I may be able to meet you and/or hear you live before I leave this world. Thank you for bringing a bright light into the world. Can't wait to check it out. Been looking forward to hearing it. OMG! Congrats Ronald! I can't wait to listen to each track like 10,000 times because I know each song will be greatness. Keep up the good work!! This is amazing, you're the best Ronald! Great CD! I've been rocking out all morning! Ronald, just one word: THANKS. I have all of your albums and love them. Tomorrow I need to drive a long way in busy traffic to one of my customers here in The Netherlands. Just bought and downloaded the new album, knowing that the drive tomorrow will be a very pleasant one! than to not hear it at all." So thank you so very much for creating such joy. Oh and a shout out to Iridium studios for recognizing awesome music when they hear it. So happy this is finally out! You have been my favorite artist since I discovered you hearing Stay Crunchy on Pandora 4 or 5 years back. 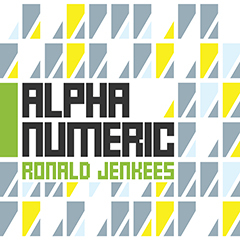 Been listening to Alpha Numeric over and over all day long, can't get enough! So awesome, listening to Slow to Spring the first time gave me tears of joy. Awesome stuff Ronald! Really diggin' it so far! Thank you for making music!!!! Waiting for Google Play to release it. The wait is killing me! I love every song on this album. Thank you, Mr Jenkees! I deliberately held off listening to any of the enticing preview clips just so that I could be surprised by every track, and boy was it worth it - every song just blew me away. It might be enough to hold me over until your next album! :) Thanks, again! Just ordered, can't wait !! This could be the greatest musical release since Mozart's final work, and that's no joke. Indeed, now that Ronald has taken us so many miles into uncharted territory, none of us really have any idea how to act. There is nothing to compare this to, honestly, as all music before Ronald Jenkees was like a clay stop-motion movie coming at us in two dimensions. And now the Third Dimension appears to be losing ground in its valiant struggle to contain the liquid, concussive sound of Ronald Jenkees. His music lives and breathes, exuding a vibrancy both unstoppable and irresistible, testing the very limits of life and being. What's next? Can even Ronald Jenkees know? Might our hero someday soon spontaneously explode into a bright and beautiful Fireball of Love, taking his music beyond us into the nether regions of space and time itself? Oh, may none of us live long enough to see that day come, for on that day we will not have been expelled from Paradise. No, on that day, Paradise will have moved on without us. It's all wonderful; my fav track is Dream Happy. Beautiful! Thanks for sharing something beautiful to the world. My car is almost done charging. I'm going to go driving for no other reason than to be immersed in the awesomeness of this album. TL - thanks for letting me know this! sent you an email. link in there, and signed CD coming your way. you are too patient! also, these other comments (and emails) have definitely made the past two days awesome. thanks so much for them. And RJ being the class act that he is got my order sorted immediately. Thank you sir. Love you and your music endlessly. "Sounds good RJ! However, I do wish you would make some more acoustic sounding beats, with the piano, violin, guitar, all the strings you know? (Like Canon in D, Remix to a Remix, Loui, Gold Spinners... Really take it back to the type of beats we all fell in love with!)" I agree with the Master here. It seems the longer a tune takes to sink into me, the deeper the satisfaction and the longer it lasts. I've noticed that even years later I keep discovering new things about it that seem to unfold over time. Dare I make a contrast? It's like fast food compared to a gourmet meal, isn't it? Easy-to-like music with a snappy 3-chords and a minor progression gets your foot tapping right away, but after a while it's like eating too much candy. Eventually it's like trying to shoot pool with a rope, and you'll move on to something else. As Ronald will tell you, if you look good and you smell good, it doesn't matter if you're broke! Wow! This is such a good album! After listening to the entire thing multiple times, I have to say that my favorite song is "Fall Drift." That electric guitar that comes in near the end of the song gives me chills every time. I really need to check my email more often! As I missed the release, and feel like I have been missing out!!! So far, I'm really digging "In Blue", but I have only began to preview this album. Definitely will be picking this album up, Thanks Ronald! Great work, Ronald! Another awesome album! Keep up the great work! So many good tunes. I don't even know which ones I might cover. I'll wait and see what RJ puts up as a video and then decide. All The Circles is probably a given though. Lol! I bought this from your website on Friday because I couldn't wait! Of course it comes out on my google play the next day :) Double purchase for an awesome album!!! I'm so humbled by another passionate masterpiece. Thank you for being a light! When will this album be available on Amazon? That's what I am waiting for but I'm starting to get anxious! I love your music and thought your last album was absolutely beautiful. I can't wait to listen to your new music. Thanks a lot! I'm not sure when it will be up there, but I'd say it could be any day or it could be a week from now. I can't remember how fast the last one went up. Thanks for asking! Thanks for replying! I couldn't wait any longer so i went ahead and purchased it from your website. I love it! Its really soothing and seems to transport me to another place. I like listening to it while I study because it calms me. Great work! I just recently discovered your music through watching Bdoubleo100 on youtube and I now have all of your albums. I love each and every one. I just looked on Amazon. It says out of stock but you can order it now and they will ship. I've listen to the album at least 20 times now. My favorite part is in Echo Out between 3:08 and 3:30. It's very uplifting for me. Hope your sales are rocking man! You deserve it! Downloading now! You make the best stuff. Killer Jams Ronald. I'm Diggin It. I'd like to know before purchasing one thing. What method of purchasing puts more money into Ronalds pocket? I want to support the artist the most with my purchase. Whatever RJ says, but my guess would be ordering directly from this website. Most direct (my website or bandcamp) is best, but I always prefer that people get the music wherever they usually get it. Thanks for asking! Seems the production has been cranked up a few notches, while all the fun is still in there. Hey, I recently heard some of your tunes for the first time and they were great1 Before I start purchasing all your stuff I wanted to know if you ever plan to release anything in FLAC or some other lossless format. MP3's are fine but I'd love to have this stuff lossless. Cheers. Hey! TV is right (thanks TV!). You can get them from https://ronaldjenkees.bandcamp.com. I think eventually I'll offer them from my website. It's another technical thing on my to-do list. "You can also download in FLAC, ALAC (Apple Lossless), AAC, or Ogg Vorbis format." Hey thanks TV, that's what I was looking for! Cheers. Yo! What do you think about a kickstarter to get you one of these crazy boards? I've been a huge fan since forever ago--my now wife bought me your first two albums in the package deal with your signature on the cases like five years ago--still bang those tracks all the time. Anyway, I saw a preview for the test run of these boards and couldn't think of anyone better than you to fly away on it. These are neat - they start shipping in early '15. I'd probably go after the small one, but I'd like to see more of them out in the wild. Hardware-wise, I'm curious as to what yamaha will do next after the XS and XF series. I miss doing more stuff on the motif but I'm itching for an update. Hi Ronald! Just wanted to tell you that i enjoy your music since your first album and i like to see your style evolve with each new release. It took a few listens to get into it but now i'm definitely loving practically every track :) Keep up the awesome work! Ronald, this is sick! Your sound has developed so nicely, and has become complex without becoming cluttered. Every tune has a wonderful presence to it and the hooks are CRUNCHY! Easily your best album to date! Thank you for taking your time and playing what YOU want. It's really inspiring to see you have so much fun making music that makes you feel good. Keep it up!! All the best in 2015 to you and yours. You are my favorite electronic music composer! If I only knew how to create music, it would be exactly what we all get from you. Thank you Ronald for making my music experience more fun. Well, this new one is mostly about fine beatz and electronic details... quite the same path as Days Away. Would be glad if Mr. Jenkees would turn back to the roots, I miss Disorganized Fun's extremly awesome improvisations. Why is it that those are gone??? How much do we have to pay to get a new youtube video? Let's make this happen. The first three seconds of "Stay Crunchy" just popped up on one of my Pandora stations. Recognized it immediately - I've been digging your music since I found you on "The Youtubes" years ago! Congrats on your continued success, Mr. Jenkees - you're awesome! I miss you brother and sister when I listen this, but I see your faces most clearly when I listen this. Through all the circles, we will remain connected. I see your faces clearly listening to this, though Ronald's music. I love your music! I love how all of your albums sound different. I like your latest album. It has some really nice songs, but Days Away is my favorite album. I don't skip any song on Days Away. I listen to your work all the time especially on road trips. That's another reason Days Away is my favorite, because most of the songs are up tempo! But I am a big fan of all your work and I have purchased all your albums from Amazon music. I know art takes time to create but give us an album at least once a year!!!!! Please(dang I think I'm a groupie) lol. God bless you! Hey, I left a message on your Facebook page, but figured I'd repeat it here. Years ago I was in grad school and pirated your albums because I couldn't afford them. I posted here telling you that once I had a job I'd buy them....I've had a good job for a few years now, but I still haven't made good on my promise. To make up for it I bought all 4 albums. I listen to your music every week while I study or write. You make great music; keep up the good work.